Launched into the collective consciousness by the podcast Serial, the investigation into Adnan Syed's involvement in the 1999 murder of his ex-girlfriend continues to fascinate in this gripping account from attorney Chaudry, a friend of Syed's family, who first brought the case to the attention of the podcast creators. Chaudry uses her unique perspective to craft a gripping and meticulously detailed account of the case including letters, court transcripts, and documentary evidence that fill in the show's gaps and provide the latest updates. Readers new to the story will have no trouble following the narrative is outlined extensively from the beginning and podcast listeners will find plenty of previously undisclosed material. Chaudry explains what Serial missed, including a lack of legal perspective, and she argues that host Sarah Koenig failed to convey the enormity of Syed's (later disbarred) attorney's incompetence. She strongly makes the case for cultural and religious bias in the investigation and conviction and presents damaging evidence of police misconduct, including tampering with evidence and a witness. She also examines other suspects and their possible motives and alibis. Syed provides running commentary that creates a depiction of the damage inflicted on a person when the system fails. Chaudry's version of a story of "justice, bigotry, faith, community, devastation, healing, and hope" points to an intentional, systematic framing of Syed by investigators, allegations that will surely spark controversy as his legal ordeal continues. Rabia Chaudry has written a book about the Adnan Syed case that has striking similarities to any JFK assassination conspiracy thriller ever written. Facts are bent and distorted in an effort to cast blame for the murder of Hae Min Lee onto someone else ... anyone other than Adnan Syed. Ms Chaudry uses convoluted and implausible theories in an effort to remove Adnan Syed from this murder. Unfortunately for Ms Chaudry, it is just as impossible to remove Adnan Syed from the murder of Hae Min Lee as it is to remove Lee Harvey Oswald from the murder of John Fitzgerald Kennedy. Ms Chaudy has no hesitation in naming an alternate suspect ... even though the named person was thoroughly investigated by the police and prosecutor and determined to have a solid alibi for the time of the murder. Ms Chaudry does not stop at simply accusing her new favorite suspect. She also drags his certainly innocent mother and her significant other into the mix. This kind of finger pointing is dangerous, irresponsible, transparent and self-serving to say the least. Ms Chaudry tells us that at one time she had a different favorite suspect ... the person who testified against Mr Syed and admitted to helping him bury the body of Ms Lee. When Ms Chaudry and her crew of podcasters began to realize that a guilty Jay could not exist without a guilty Adnan, they switched their story to demonize the Baltimore Police Department and the District Attorney of Maryland ... inventing the most outlandish conspiracy theories imaginable ... all to convict a seventeen year old high school student of murder. While this tome is utterly useless in determining the truth behind the murder of Hae Min Lee, a number of interesting facts do emerge. The book is full of passages that encourage reading between the lines. 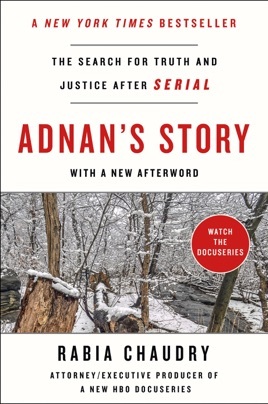 Beginning on page 205, we learn the story of how Adnan became a married man in prison. We are told that Adnan was able to save a lot of money while incarcerated by providing certain questionable services to his fellow inmates, including providing "contraband" and "medicine" to them. Adnan was able to save up a dowry of $10,000 to offer his new bride. In spite of the generous and unusual dowry, we learn that when Adnan was later transferred to a maximum security prison, he became a divorced man. Ms Chaudry also publishes a letter Adnan sent to Sarah Koenig prior to the inception of "Serial". Those of us who listened to "Serial" will surely remember the effort to determine whether there was a pay phone at the Woodlawn Best Buy and / or its exact location. Strangely enough all that speculation could have been settled long before the recording of "Serial" ever commenced. On page two of the referenced letter, under sub-heading four, Adnan writes: " And then I walk into the Best Buy lobby and call Jay Wilds and tell him to come meet me there?" Sarah Koenig could have saved herself the trouble. Adnan had already confirmed that there was a pay phone in the lobby of the Best Buy a year before "Serial" ever aired. Ultimately Ms Koenig did confirm that location for the telephone. There are many other interesting tidbits like these if you would like to read this book to uncover them. However, if you are reading this book to learn the truth about the murder of Hae Min Lee, don't bother. This book is very much like an autobiography. You will only read what the author wants you to believe. In the end, it is hard to determine the exact purpose of this book. Ms Chaudry spends a lot of space alleging that Mr Syed was targeted, prosecuted and convicted purely due to his faith. Readers everywhere will agree that religious discrimination is absolutely wrong. However, it is equally narrow-minded to attribute a lawful arrest, prosecution and conviction to religious discrimination when there is absolutely no evidence of its existence in this case. Is Rabia Chaudry defending Adnan Syed? Or is she defending her culture? Having listened to Serial and Undisclosed, I thought this was a good summarization of both with some additional info. Overall, Rabia does a exceptional job telling the story. It was interesting to read about some of her personal struggles, and she definitely pleads Adnan's case vehemently with emotion that pours off the page.